Product #1268 | SKU C21-5341-201 | 0.0 (no ratings yet) Thanks for your rating! 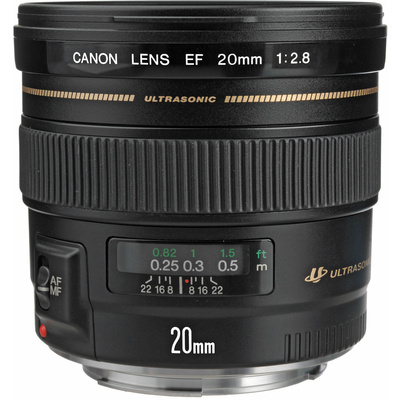 The EF 20mm f/2.8 USM Lens from Canon is an ultra-wide-angle lens with a fast maximum aperture for full frame EF mount cameras. A floating rear focusing system gives sharp images at all subject distances and an ultrasonic motor (USM) enables fast, smooth and quiet autofocus. Full-time manual focus override allows for precise manual focus even when in AF mode. The minimum focus distance is 25 cm. Sharp, high-contrast images and minimised aberrations result from the lens' optical construction which includes aspherical and Super UD lens elements. Canon's Super Spectra lens coating suppresses ghosting and flare by absorbing light that might otherwise reflect off the camera's sensor. A metal front barrel- including filter ring and lens hood mount- provides durability and a stable hold for those optional accessories.